Watershed or catchment area is a geographic area within which all water, sediments, and dissolved substances drain into the same river or water body. Watersheds can range in size from a small pond near the top of a hill to the Mississippi River and the minor and major tributaries that drain into it. There are often many smaller watersheds also known as "sub-basins" within larger watersheds. For example, the Winooski River watershed has six headwater streams or rivers that flow into the larger Winooski River and ultimately into a bigger catchment area, Lake Champlain--the largest watershed in Vermont. Lake Champlain Basin spans two states and two countries. The lake drains north from Whitehall, New York 120 miles to the outlet at the Richelieu River in Quebec. From there, the water flows into the St. Lawrence River and eventually into the Atlantic Ocean at the Gulf of Saint Lawrence. Lake Champlain has 587 miles of shoreline, over 70 islands and 6.8 trillion gallons of water. Compared to other larger lakes in the United States, Lake Champlain is unique because of its depth, width and watershed size. Over 90% of the water that flows to the lake comes from the surrounding watersheds or sub-basins. The ratio of Lake Champlain to its watershed is 1:18, while the Great Lakes are 1:2. Lake Champlain contains eight or nine sub-basins depending on which map you use. Five and one-half of a sub-basin are in Vermont, New York has two and one-half sub-basins and Quebec shares a portion of three sub-basins. The total area of the Lake Champlain Basin (Basin) is 8,234 square miles, 56% of which is in Vermont, 37% in New York and 7 % in Quebec. The sub-basins are: Missisquoi/Pike Basin, Lamoille Basin, Winooski Basin, Otter/Lewis Basin, Poultney-Mettawee/South Lake Basin, Boquet/Ausable Basin (NY), Saranac/Chazy Basin (NY) and Grand Isle Basin. An outlier basin is one that groups all of the brooks and small streams that drain directly into Lake Champlain without connecting to one of the larger tributaries after which the sub-basins are named. This ninth basin is known as the Lake Champlain (direct) basin. Below is a list of watersheds within the area where Watershed Alliance works. Click a name for more information, including monitoring data reports. You can also find watersheds on our interactive map. 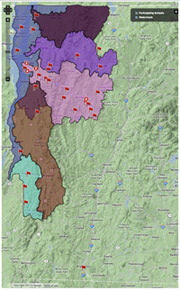 Information on sub-basins provided by the Lake Champlain Basin Program Atlas.